Embedded networks are on the rise in Australia, with approximately 500 large-scale and thousands of smaller embedded networks established across the country. It is already common practice for developments such as shopping centres, airports and apartment buildings to be implemented as embedded networks. The next frontier involves large residential housing developments, where entire neighbourhoods are owned and operated as embedded networks, potentially reducing the scope of the traditional electricity network service provider. Reductions in the cost of emerging generation technologies, including solar PV and energy storage, may further enhance the value proposition of embedded networks, by increasing the ability to control electricity demand levels at the connection point to the main grid. This article explores the challenges and opportunities arising from this emerging type of embedded networks and the implications they have for incumbents and the industry as a whole. Embedded networks (EN) aggregate the energy consumed within a complex to a single metered point connected to the main electricity network. Common ENs include airports, ports, shopping centres and apartment buildings. The EN concept is presented in Figure 1 below. Retail and metering services provided by an embedded network operator (ENO), who is not an authorised retailer or accredited provider. This type of arrangement is known as “off-market” activity because the customers are not visible in the NEM. Customers have chosen an authorised retailer instead of the embedded network operator as their retailer. Customers are still provided with network services by the ENO. 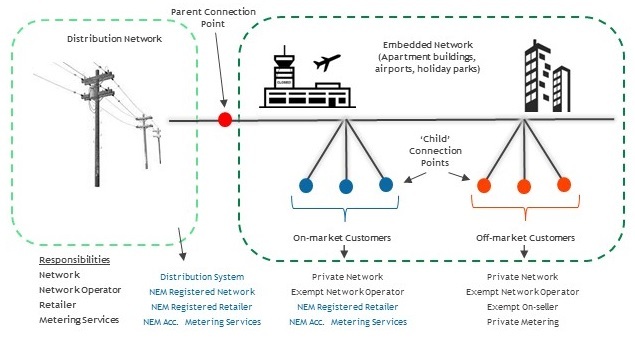 This type of arrangement is called “on-market” activity because the customers are included in the NEM market systems and are visible to AEMO and NEM participants. More bargaining power from representing a group of customers and the ability to negotiate a dedicated retail rate. The majority of benefits available is generated from the bargaining power provided to the ENO. Retail charges account for approximately 40-50% of a residential customer’s electricity bill, and the ability for load aggregation presents the ENO with the opportunity to negotiate for a lower charge, similar to what is the case for larger electricity users. This in turn represents an arbitrage opportunity for the ENO. What are the implications for Australian Network Providers? Lower distribution use of system (DUOS) charge. Connection and metering charges would be lower for an EN compared with a conventional development – rather than being charged for connecting each individual metering point, the EN owner gets charged only for the parent connection, which can be further reduced depending on the voltage of the connection (e.g. 33kV sub-transmission). Further reductions in the connection charges could theoretically be achieved by installing Distributed Energy Resources (DER) targeting peak demand to reduce the overall required capacity of the connection. Lower RAB growth will be a key risk going forward if developers choose to implement significant number of developments as ENs with a dedicated network, as is the case with the dedicated 33kV network for Barangaroo in Sydney. This trend has not transferred to more suburban residential housing developments as yet, but if it was to materialise it would further impact RAB growth. MHC has undertaken analysis of the potential RAB impact for Australian Distribution Network Service Providers (DNSPs) from a higher share of future property developments being developed as embedded networks with a dedicated electricity network infrastructure. MHC’s analysis is based on the forecasted number of greenfield lots in each state, and the current RAB per customer per DNSP. MHC has further undertaken sensitivity analysis to build a picture of the potential future RAB impact. 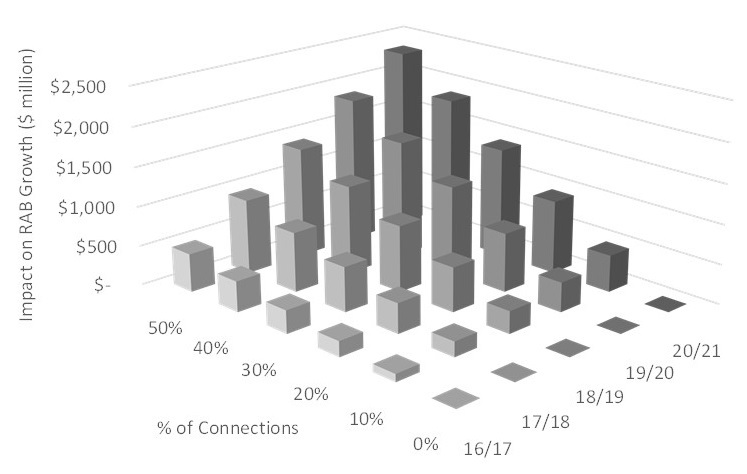 If 50% of future developments are developed as embedded networks with no dedicated DNSP assets, this translates to a potential cumulative reduction in RAB growth of approximately $2.3 billion by 2021 across VIC, NSW and QLD. Lower DUOS charges would likely only emerge if existing ENs incorporate some form of DER to provide on-site energy. As the cost-curves of solar PV and energy storage technologies continue to fall, this is likely to become an increasingly attractive proposition. The EN proponent would however not be able to collect government incentives such as feed-in-tariffs (FiTs), which may create a minor barrier. Another barrier to increasing levels of DER on ENs is the fact that they would effectively reduce the amount of electricity consumed from the grid, on which the EN manager is currently collecting a margin. However, as retail competition for EN customers increases, this margin would be assumed to shrink and, as a result, make DER more attractive for EN proponents to provide a value-add to their customers. What does the future hold and what are the opportunities? Several large developers are looking at residential block developments as the next major area of expansion – the majority of bigger apartment/office buildings are already operated as embedded networks. Residential housing developments are the next frontier. The key barrier to this is a perceived risk of the combination of a private, embedded network with the presence of public roads within the boundaries of the embedded network – this creates a potential issue in the event of a fault, as it is not clear who will be responsible to address it. There are clear opportunities for EN providers to look at DER solutions to either reduce the cost of connection by reducing the demand of the development, or take the entire section off-grid and form a microgrid. Some established players are actively looking at this as an option. There are also likely to be changes to the rules governing ENs. A draft rule determination is with the Australian Energy Market Commission (AEMC) regarding reforms to improve clarity and consumers’ options within the EN market. It further includes the creation of a new accredited provider role in the National Electricity Rules, the Embedded Network Manager (ENM), whose function is to perform the market interface functions that link EN customers to the electricity market. Under the draft rules, any party (including an ENO) can undertake EN management services so long as they meet the Australian Energy Market Operator’s (AEMO) accreditation requirements regarding EN management services. The proposed reforms to the EN regulation will introduce the new role of the ENM. There is an opportunity for NSPs to provide these services, as the description aligns well with their current skillsets and service offer. There is a further opportunity for NSPs to engage directly in the market through a ring-fenced entity to build, own and operate ENs. 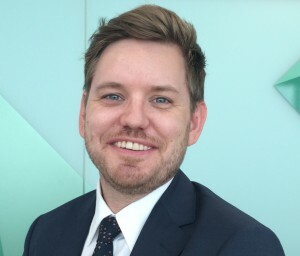 The main risk to this approach is that the major property developers have established their own EN capabilities and would be unlikely to outsource these services to other parties, unless these offer a competitive price point. There are further opportunities to use future greenfield developments as a test bed for new technologies and business models. This includes the potential to trial different options for a DER platform approach, enabling customers to trade the value created by DER. DNSPs would be ideally placed to partner with developers to implement innovative and ambitious trials in greenfield developments to refine future network business models and service offers. MHC sees a future where the market moves increasingly towards community-based solutions, where local DER solutions are installed and an EN provider, or similar service provider, is responsible for energy services in that area, including network management. This model could be extended to other services, including water and wastewater. This is part of a growing trend where the value and the traditional monopoly position of the electricity network provider is being chipped away. The challenge for Australian network providers is to deliver the value-add, customer-centric solutions that optimise existing assets and generate alternative revenue streams.